The Bunker King Supreme Pack and the HK Army Zero-G Packs are the first paintball packs that offer the no pod strap design. The purpose of these packs is to make loading in-game faster and easier. These packs are very similar but there are differences. Both hold the pods very well. They have the ability to hold an array of different pods. The packs are also made by two companies that have very loyal customers, which weighs heavily on how people will make the purchase. How many Pods can it hold? The first difference is how the packs hold the pods. The Bunker King Pack uses tension on the inside of the pack to hold the pods from falling out. You are able to use the traditional 140 round pods, and the Virtue 140 and 160 round pods without having to adjust anything. The pack is very light and comfortable and conforms very well to your back. The Bunker King Supreme Pack comes in a few different colors, Black, Heisenberg and Red. You can check them out on Tri-City Extreme here. 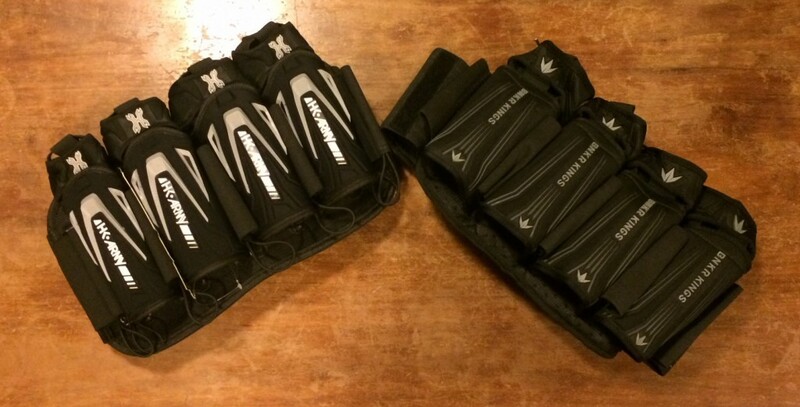 The HK Army Zero-G Pack uses a system that can be adjusted from the inside of the pack. This way you are able to use whatever pods you would like. If you start to lose pods you are able to go in and tighten it. If you have a friend that has the pack in a different color you are actually able to swap color pod holders and make a unique color scheme. Because of this design the pack weighs a little bit more and is less conforming than the Bunker King Pack. It does take up a little bit more room on a players back but you do have the ability to hold 2 additional pods compared to the Bunker King Pack. The HK Army Zero-G Pack comes in Artic, Black, Red and Slime. You can check them out on Tri-City Extreme here. Both packs bring a new element into the game by making loading in- game a little faster and more convenient. We have all heard the controversy about Bunker King making the strapless design first. 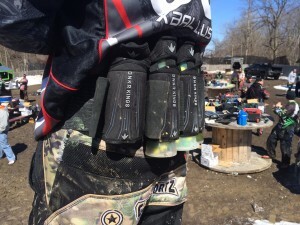 However, we will probably see other companies switching to the strapless design in the near future, just as pod packs switched from pulling pods from the side of the paintball pack to the bottom of the pack. This entry was posted in Editorials, Paintball Reviews. Bookmark the permalink.